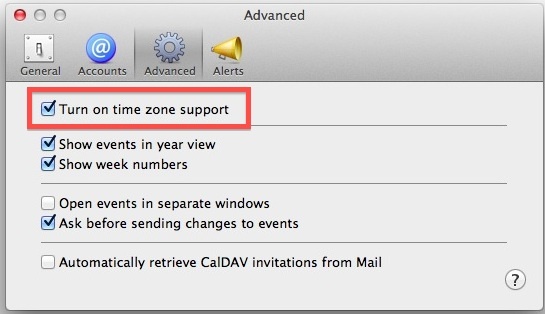 The Calendar (once called iCal) app of Mac OS X has full support for Time Zones for the entire calendar, individual events, shared calendars, and even invitations, but it must be enabled separately within the preferences. If you rely on Calendar app for just about anything and travel or work across time zones with any regularity, this is a worthwhile feature to turn on, particularly for those who also sync the calendars between OS X and iOS. You will find the current Time Zone now visible in the upper right corner of the Calendar window, which is actually a pulldown menu where you can adjust the time zone for the calendar if needed. Do note that all existing events will now be associated with the default active Time Zone, unless specified otherwise universally this way, or set individually as we’ll cover in a moment. It’s a good idea to have the general system-wide Time Zone detection feature enabled if you’re going to use this feature, that way the Mac will automatically change itself to the current locations time zone when it has detected a change. 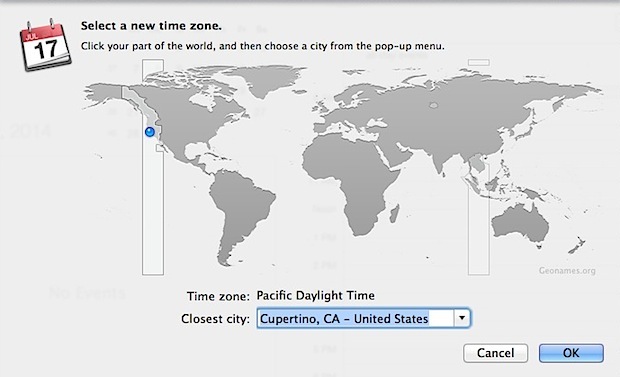 OS X usually has this turned on by default, but you can double check in System Preferences > Date & Time > Time Zone > to be sure that “Set time zone automatically using current location” is turned on. Any events with unique time zones set will sync across to iOS devices that are configured with the same Apple ID and iCloud account. Because the iPhone is typically always connected to the internet through cellular connections, it will adjust the time automatically to changes in location, and the Calendar events with zones set will reflect that. This trick works the same in OS X Mavericks, Mountain Lion, or Lion, and syncs across to all versions of iOS that support iCloud. 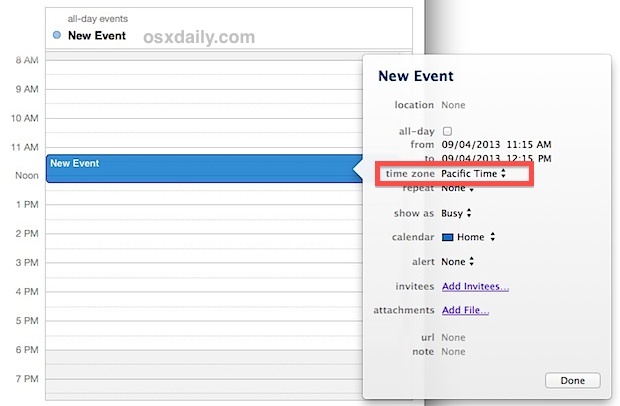 I wonder if OSX Calendar can emulate a feature that I used to use in Outlook? Outlook would allow the user to enter the start date & time and end date & time in separate timezones. This was handy when taking a flight that traversed different time zones. Example; flight departs at 3pm Pacific Time and arrives at 10pm Eastern. Put those date | times | zones into the Outlook calendar event and it would work out the duration of the flight. An even better Outlook feature was what I called User Standard Time which is whatever time it is wherever I happen to be. The calendar doesn’t know or care what time zone I’m in or the appointment is in. It simply never adjusts times. If I have a meeting at 9AM in New York, I put it at 9AM, even if I happen to be in San Jose when I make the appointment. And I never have to do the double take when I see a meeting scheduled for 6AM just because I’m not in that time zone yet. Too simple? It worked for me. I’m with RickT on this. Keep it simple, especially for something that I am supposed to trust and use daily. If I create an event starting at 10am, it should start at 10am no matter where I happen to be when I view the calendar. Seems pretty obvious, and seems like it should be the default behavior. What is the “other” use case? Someone who travels so much they regularly do not know what time zone they will be at any moment, and so they want their phone calls to happen at a set time in some fixed location? Or someone who creates events planned in other time zones with their local time zone because they hate to change their watch when they travel? Shame (and baffling) that it doesn’t have the feature present in iOS, which allows you to enter the start and end times in different timezones, for example, for an international flight! I agree with both methods, and use depends on the individual and how they interact with time zones. Isn’t that what preference options are all about? For flight times I like to be able to input the appropriate timezone for each leg. For meetings, I like to be able to see what time it will be on the other side of the country. My colleagues tell me am not alone in thinking “sure 9AM will be fine – that will be 12 my time” and it was really 6AM, yech. The problem I am having with my calendar is that some appointments come up with a time zone field, and others do not – why? I can add an event for a flight, select the time zone, then enter another event and the info will not contain a time zone option. Puzzled.